State Rep. Kit Roupe (R-Colorado Springs) has cleansed a false “public service announcement” from her Facebook page. “If it was false, and it came to my attention that it was false, then of course I would [remove it]” Roupe told me. 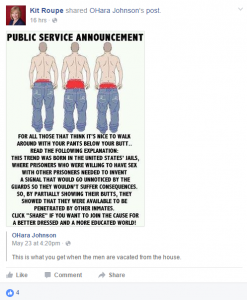 Roupe removed the sagging-pants fake news item after it was cited in a December BigMedia.org investigation of fake news appearing on the Facebook pages of state legislators. In this case, the sagging-pants falsehood had been proven bogus by Snopes about a year before Roupe posted it. While I disagree that state legislators like Roupe should spread rumors to ignite conversation, I give Roupe big credit for removing fake news from her Facebook page and thereby advancing the cause of fact-based discourse. Roupe told me she didn’t remember the sagging-pants item specifically and that she manages her own Facebook page. So she would have been the one to remove it. Roupe did not post reasons for deleting the sagging-pants fake news item. Roupe, who’s loss in the November election means she’ll be leaving the State Legislature this week, declined to sign The Fake News Pledge, telling me in an email that it’s “moot” due to her imminent departure. She did not respond to my request to sign the Fake News Pledge for ordinary citizens. The other state lawmakers, whose Facebook pages were found to contain fake news, have yet to remove the inaccurate items. This entry was posted on Monday, January 9th, 2017 at 8:56 am	and is filed under Colorado State Legislature, fake news. You can follow any responses to this entry through the RSS 2.0 feed. You can skip to the end and leave a response. Pinging is currently not allowed.